Would you like to GET PAID to write a book? If you're thinking this is plain fantasy, think again. All professional writers get paid to write their books. How? They sell their books via proposals before they write the books. A book proposal is a document which convinces a publisher to buy your book before you've written it. Your proposal says, in effect: "Hey, I've got a great idea for a book which lots of people will want to buy. Do you want to publish it?" Think of it as a combination brochure and outline of your proposed book. It's easily possible to make a fast $10,000, or even a six figure amount. You could even make seven figures --- over a million dollars for twenty pages of text. It sounds incredible, but a fast seven figures is certainly possible if you have a HOT, hot idea or have had an experience that hundreds of thousands of people want to read about. In his 2001 book about writing non-fiction, Damn! Why Didn't I Write That?, author Marc McCutcheon says that it's not hard to make a good income writing non-fiction: "you can learn the trade and begin making a respectable income much faster than most people think possible". Do you need experience to sell a book on proposal? 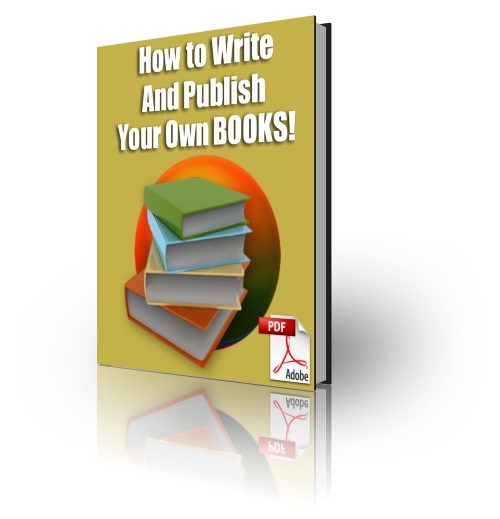 "How to Write and Publish Your Own Books" shows you how to go from idea to completed book proposal in seven short days. Imagine --- in seven days, you could be sending your proposal to agents and editors! The ebook includes everything you need to know. Just follow the easy steps. It even includes a sample proposal, which got a contract from an agent immediately it was sent out. Here's what you'll discover in "How to Write and Publish Your Own Books"
Exactly what a book proposal is, and an EASY way for you to come up with more saleable ideas for books than you could write in a dozen lifetimes. If you're feeling nervous now that you're about to start this project, relax. Tell yourself that you will take it step by step. All you need to do is work at it steadily, a word, sentence and paragraph at a time, and you will complete your proposal, and then when you've sold the proposal, you'll complete your book using the same easy-does-it method. While we're at it, let's dispel a few myths. It takes a special talent to write books. It takes persistence. There are as many different kinds of writers as there are people. Some are young, some are elderly, many are in-between. You donâ€™t need any special writing talent to write books, nor do you need to be highly educated. Many successful writers have never completed high school. If you can write well enough to write a letter, you can write a book. Many professional writers make incomes that would make doctors and lawyers envious. Most make reasonable incomes. If you decide to make a career of writing nonfiction books, the major benefit is that if you choose your book's topic with care, your book can stay in print for many years. For each year that your book's in print, you get two royalty checks. Let's say that you write two books a year for five years. At the end of the five years, if your books all stay in print, you'll be getting ten royalty checks a year. These ongoing royalties are your nest-egg, profitable investments in your future. The "blurb" is the back cover material for your book --- the selling points which will get people to buy the book. If you write the blurb before you write an outline, you're guaranteed not to wander off the track as you write your book. Writing the blurb will keep you on-track as you write your proposal and your book. I've included two sample blurbs from my published books to show you how to write a selling blurb. The fast and easy way to research your proposal â€“ you may not need to do any research at all. You may already know all you need to know. How to write a SELLING query letter, with sample letters which have SOLD books. The fast and easy way to write your proposal --- everything you need to include to make sure that your proposal SELLS. Seven days, and you're done! How to write the professional way, and a step by step easy way to revise. "How to Write and Publish Your Own Books also includes a complete, selling proposal, which got a contract from the first agent who saw it. Have you always want to write a book and be a published author? This ebook gives you a complete method. The ebook shows you EXACTLY HOW to write and SELL. You can be a published author much faster than you imagine. Can I show you how to write a book proposal that sells? Yes! I've sold many fiction and non-fiction books, all on proposal. This ebook includes sample proposals which have SOLD. I show you exactly what to do, and explain the methods I use to write and sell. If you've ever thought "I could write a book" --- you can! Can I guarantee that you'll sell your proposal? I can't guarantee it , but I'll make it several thousand times more likely that you'll sell. You'll learn what a professional, selling proposal looks like, and will learn how to write a professional, saleable proposal. Publishers receive hundreds of proposals each week. As any book editor or agent will tell you, 99% have no chance of selling ever --- they're amateurish. Working with this ebook will ensure that your proposal makes it into the 1% of saleable proposals.